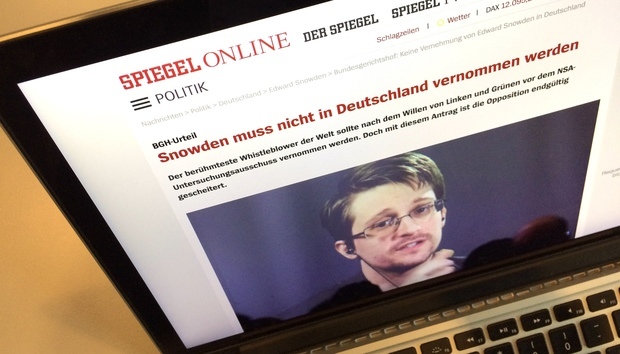 It's almost four years since Edward Snowden leaked U.S. National Security Agency documents revealing the extent of the organization's surveillance of global internet traffic, but he's still making the headlines in Germany. At the Cebit trade show in Hannover, Germany, he'll be looking back at that period in live video interview from Moscow on Tuesday evening. There have been a lot of changes on the internet in those four years, but one of the biggest is the growth in the use of encryption. In 2013, the NSA had free rein and could listen in on almost any communication it wanted. Now, it's commonplace to encrypt traffic to webmail services and even popular websites such as Microsoft.com or Google.com using the https protocol. And you don't have to be an enemy of the state to use an end-to-end encrypted messaging system such as WhatsApp simply to chat with friends. The encryption seems to be working, too. Leaked files from the U.S. Central Intelligence Agency, published this month by Wikileaks, show no obvious signs that fundamental encryption systems have been broken. Instead, the agency's focus seems to have been on subverting smartphones and other terminal devices so that it can access data before encryption, or after decryption. Keeping unwanted visitors -- of whatever nationality -- away from your data is therefore key, and some of the exhibitors at Cebit have ways to help you do just that. Secusmart, the BlackBerry subsidiary that secures German Chancellor Angela Merkel's smartphone, is showing new a version of its SecuSuite security software compatible with Samsung Electronics' Knox platform. That means that organizations looking for smartphones offering government-grade security will soon be able to buy a Samsung Galaxy S7 or S8 rather than the now-discontinued BlackBerry OS smartphones like the one Merkel uses. In addition to encrypting communications and data stored on the device, SecuSuite for Samsung Knox also secures voice calls using the SNS standard set by Germany's Federal Office for Information Security (BSI). Genua is showing its Data Diode. Named for the electronic component that only allows current to flow in one direction, it allows the transfer of data, log files, backups and emails into a network at up to 3 Gbit/s, while ensuring that only the necessary protocol status messages are sent back. Sometimes we choose to let data escape from our networks. The digital assistants in our phones and in appliances like Amazon Echo or Google Home record a lot of what we say and do, and send it to their creators' cloud services for processing. Amazon's lawyers have recently been fighting to keep that information secret for its customers, but if you don't want to rely on a court verdict for your privacy, you might prefer your voice-controlled assistant to do all its processing at home. Semvox has developed an intelligent speech interaction system, ODP S3, that operates locally or in the cloud. It says it's suitable for automotive, industrial, smart home, medical device and robotics applications, among others. Best practice, these days, is to encrypt all your data at rest, something that many operating systems will do for you these days. What do you do, though, if you didn't encrypt the data on an older device, but now want to securely dispose of its hard disk? If you only have a few such disks you can just drill holes in them, but after a while that will get boring. If you're decommissioning hundreds of disks you might want to automate things with the HDS230 hard drive shredder from HSM. They have a plentiful supply of disks to shred, but you can also bring your own if you really won't need that data again. If you did encrypt your data, you'll need to remember the password. But if you need to share access to that data, what then? Remembering passwords -- and remembering who in the enterprise should have access to them -- is the job of Password Safe from Mateso. The software can provide temporary, time-controlled access to passwords, logging who has used them and when. If it's too late and you've already forgotten your password, maybe the magician on the Mateso stand can pull it out of thin air. India: How Feature Phone Apps Thrive in Emerging Markets… Now Spurred on by Romances!